A giant hole in Guatemala swallowed more than ten houses on Friday. 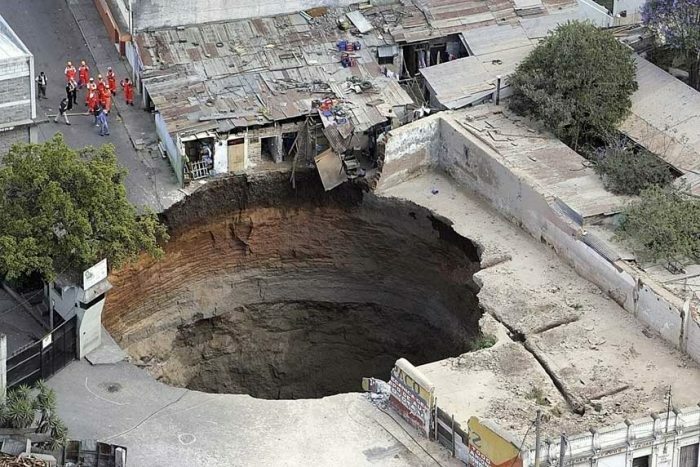 This huge sinkhole is said to be more than 100 meter (330 feet) deep, it's located in a poor district of Guatemala City. Residents say the big hole suddenly appeared. 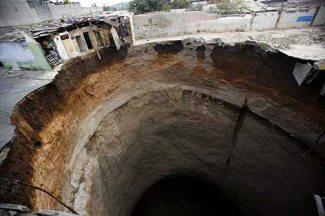 The earth started shaking and loud noises were heard, several houses collapsed into the sink hole but no one got hurt. Locals say the air which arose from the hole smelled bad, just like a sewer. Initially, a man and two teens were missing but according to BBC News they turned up later. According to Guatemala City officials the hole was caused by leaking sewer pipes, which eroded the earth. Guatemala City's major Alvaro Arzu says the sewers will be repaired and help will be offered to those affected. The pictures are courtesy of Nordic newspaper site Dagbladet.